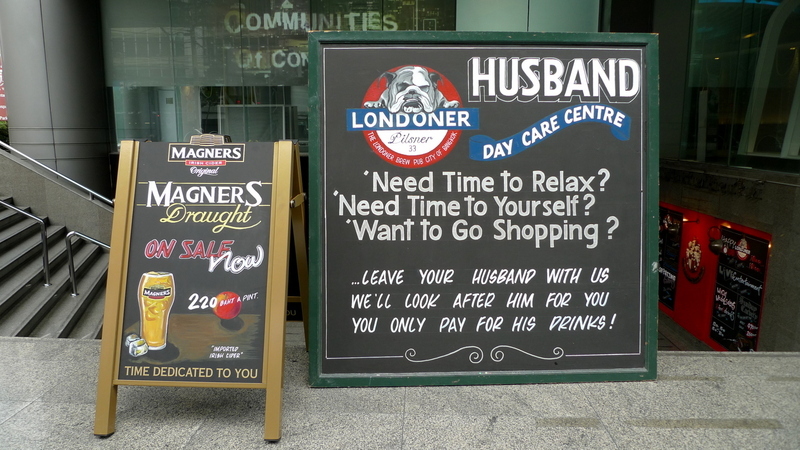 I was tickled by this sign posted outside the Londoner Pub on Sukhumvit Road near the Emporium shopping center. Hehe. I’d never leave my husband there. If I am going to endure the rigors of shopping, he’s coming along. Misery loves company. HA… great idea, but I’d still never leave my husband there. If I’m going shopping… he’s going too! How about the husband goes shopping and I stay there and drink all the beers and cider I want? Mmmm, that’s some pretty creative advertising! Sounds like a total sausage fest. I’d say that’s a win-win proposition. Goodstuff! @ClashoftheTaiten – @paperblanks – @epiginoskete – @awoolham – @secade – @Fatcat723 – @Randy7777 – Glad you all enjoyed. @murisopsis – @Passionflwr86 – @lucylwrites – Yes, there’s definitely the sense of “Why should *I* be the one to suffer! ?”@XXKimPossibleXX – I can attest that this is a legitimate pub… whatever that means! That is a smile bringer if any. Is the place busy? Will they refuse admission to the wives if they want to tag along to see if the husbands behave and are well looked after? I think that craft stores are missing a chance of profit by not having a room for husbands where they sell sodas and snacks and have a TV! I see so many guys sitting outside of Hobby Lobby in their cars, waiting. Interesting sign.. I wonder how many husbands stay there while wives shop…. Smart idea :] It would definitely make me want to go in just by how creative the sign is. haha… they should post the same sign outside ALL of the pubs in asia to get people more enthusiastic about beers like they do in london. when i was in london last year, i noticed tons of men and women in business suits were standing leisurely outside various pubs with a jug of beer in their hand during LUNCH HOUR. guess they all have a pretty good metabolism to withstand working while intoxicated. @Niel – Certainly no claims made for how original an idea it is! =D@ZSA_MD – Oh, women are most certainly welcome. During the day, the place is pretty slow which I think may be why they are trying this marketing angle. At nighttime, though, this and several other pubs in the area get quite busy. @whyzat – Great idea… even better, why not have Hobby Lobby and True Value open up joint stores? Couples could go shop and there would be something for everyone? @armnatmom – Good question… I’m not sure how effective it is but at least it catches one’s attention. @Devilzgaysianboi – If it catches your eye, it has succeeded, right? @rudyhou – Maybe just a British thing? ha ha… @yang1815 – Designed with you in mind for when you finally bring Sugi to Bangkok. We can have a pint and Tawn and Sugi can go shopping.